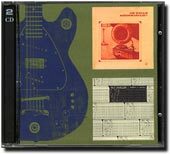 The cover of 1998's Modern Phonography/Sending Out Signals 2-CD Deluxe set. 1998 saw the reissue of both of my solo albums on CD, 1978's Modern Phonography, and 1982's Sending Out Signals. The 2-CD deluxe set contains all of the original tracks from both LPs, as well as a number of selected bonus tracks. These include original and early demo versions of a number of the songs on both albums, unreleased demos, studio and live tracks, with some featuring The Patron Saints and Garrison. The package contains all of the original artwork for both albums, and all of the cuts were digitally transferred directly from the original master tapes. Only 500 sets were released. You can check out the track listing/audio clips for Modern Phonography here, and the those for Sending Out Signals here; order the CD set here.